The Civ IV mod Fall from Heaven II introduces a new feature to the base game: magic. But this ain't your uncle's spellbook. These spells affect entire cities. Then there's this really cool feature each civilization has called World Spells. They are literally spells which affect the whole of the game world. As far as I can tell there isn't any kind of spell system for 5e that covers magic on such a large scale. It's a really cool idea so I'm going to try my hand at whipping something up (+1 for mixed metaphors!). So how far reaching are these so called World Spells? Well, let me give you a few examples. Remember in The Two Towers when the Ents found out what Saruman was doing? They woke up and then proceeded to disassemble Saruman's army, manually. In FfH that one's called March of the Trees. Each square with a forest on it produces a treant that lasts for several turns. In an elf empire where all the squares are usually covered in forests, you end up with an army of treants. Another spell, called Arcane Lacuna, for a set number of turns prevents all other civs from using magic. Period. Yep, the wizard civ is now the only civ that can sling magic. 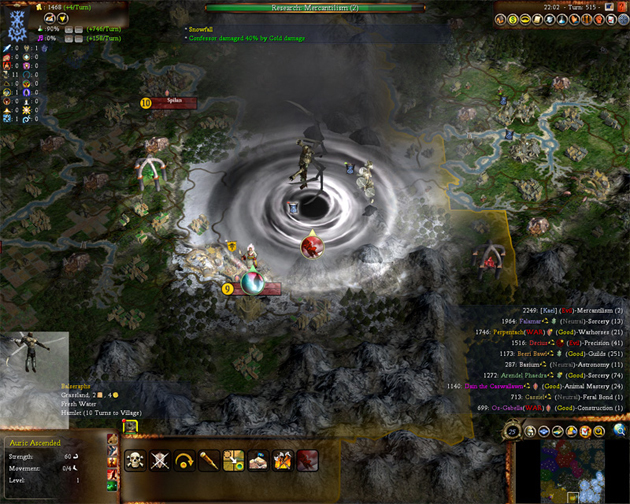 A similar spell the winter civ uses is called Stasis. A malaise sets in across the peoples of the world and all production grinds to a halt. The demon civ has a thing called Hyborem's Whisper, where demons erupt from the lower planes and overrun three cities with an evil religion. Lastly, the evil summoner civ has a thing called World Break. It literally sets the world on fire. Sound cool? You bet it does. As usual, let's see what we’re dealing with in the core rules. Rituals: spell must have [ritual] tag; +10min casting time; doesn’t expend a spell slot & can’t be cast at a higher level; can only be cast by classes that grant a feature to do; caster must have the spell prepared if cleric or druid, unless the class feature specifies otherwise as wizard or bard; can add new spells on class spell list for a cost. Ritual Caster (feat): must have a ritual book in hand while casting ritual spells; need not prepare the spell; choose a class to cast as; can only cast spells from that class’s spell list; gain two 1st level spells; can write in new spells on class spell list for a cost. Pact of the Tome (warlock feature): gain three cantrips from any class’s spell list; can cast those at will while book is on your person. Book of Ancient Secrets (invocation): ritual caster feat; plus can cast any warlock spells with ritual tag already known as ritual; can write in new spells on class spell list for a cost. With this in mind we have a foundation to build on with World Spells. Now what to add? Specifically, how are World Spells different than regular rituals? Scale, of course, but there’s more to giving this concept an epic field than only increasing a regular spells duration and range. Let’s start with limiting who can effect this kind of magic. I'm thinking World Spells are exclusively 9th level spells, which limits their casting to 17th level characters with full spell progression. There also needs to be a personal cost to the caster. The wish spell is a good place to draw inspiration for this. In 5th edition, it’s capabilities are very rigidly defined with a caveat allowing for Dungeon Master interpretation. In the end, however, there are penalties for casting this spell. Until the caster takes a long rest, each time he casts another spell he takes 1d10 necrotic damage per level of the spell caster. The caster’s Strength drops to 3 for 2d4 days (shortened by 2 per each day of rest). Finally, if using wish for another purpose aside from duplicating a spell of 8th level or lower, there’s a 1 in 3 chance of permanently being unable to cast wish ever again. Further, world changing magic should not be a daily occurrence. It should be momentous, maybe happening once per a world age. If you think about it, a 17th-20th level wizard or sorcerer could use his single 9th level spell slot every single day. As long as said wizard/sorcerer uses this spell slot to duplicate a lower level spell he can go on using wish ad infinitum. But if the caster gets a little creative he suffers severe penalties in addition to possibly losing the ability to cast the spell. And this is for a spell that in terms of scale can not create anything larger than a 300 foot cube. Knowing that we want World Spells to be incredibly limited in use, it seems fair that the casting of such should result in the permanent loss of a 9th level spell slot. In order to permanently change the world, the caster has to permanently sacrifice a portion of their magical ability. In the next part of this series we’ll explore the specifics of casting World Spells, such as casting duration, spell effects, using multiple casters, and magic items as spell components.